In celebration of the Tony Awards, Sofitel New York today unveiled a transformation of its lobby into the Fraver Art Gallery. Through June 30, theatergoers and art lovers alike can view works by theater poster legend Frank “Fraver” Verlizzo. As the Official Hotel Partner for the 2018 Tony Awards, Sofitel New York curated 36 of Fraver’s most iconic posters to display in the gallery – all of which were designed for Tony Award-winning and/or -nominated productions on Broadway. Selecting the works was no small feat as Fraver has created over 300 pieces for Broadway, Off-Broadway, regional and international productions throughout his career. Displayed works are accompanied by anecdotes from Fraver, allowing guests to connect with the artist on a more personal level. These include Sunday in the Park with George, which was recognized for Best Scenic Design and Best Lighting in 1984, in addition to being nominated in nine other categories that year; Sweeney Todd, winner in eight categories at the 33rd Annual Tony Awards in 1979, including Best Musical, Best Performance by a Leading Actor in a Musical and Best Performance by a Leading Actress in a Musical; and The Lion King, 1998’s Best Musical, which also took home wins for Best Costume Design, Best Choreography and Best Lighting Design, as well as nominations in five other categories. The Fraver Art Gallery opens just weeks before the launch of Fraver’s book, Fraver by Design – a celebration of Fraver’s award-winning artwork spanning five decades in the industry. 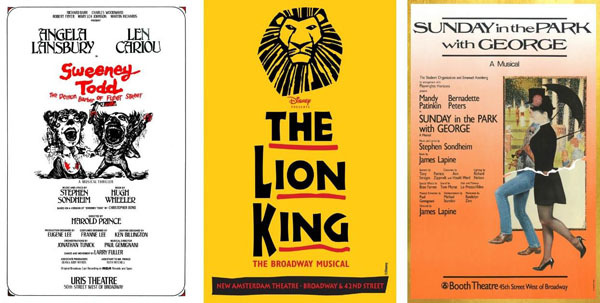 Among 250 of his theater poster designs, the monograph collection will feature an additional 40 unpublished, never-before-seen poster sketches for some of Broadway’s favorite shows. Anecdotes from Fraver’s career will also be found in the book, along with commentary from 22 theater glitterati, including Bernadette Peters, Dean Pitchford, Ted Chapin, Judy Kaye, Liz Callaway and Jack Viertel. The Tony Awards, presented by The Broadway League and the American Theater Wing, will air live from Radio City Music Hall on CBS on Sunday, June 10. Sofitel New York is the Official Hotel Partner of the 2018 Tony Awards. Sofitel Hotels & Resorts is an ambassador of modern French style, culture and art-de-vivre around the world. Established in 1964, Sofitel is the first international luxury hotel brand to originate from France with over 120 chic and remarkable hotels in the world’s most sought-after destinations. Sofitel exudes a refined and understated sense of modern luxury, always blending a touch of French decadence with the very best of the locale. The Sofitel collection includes such notable hotels as Sofitel Paris Le Faubourg, Sofitel London St James, Sofitel Munich Bayerpost, Sofitel Rio de Janeiro Ipanema, Sofitel Washington DC Lafayette Square, Sofitel Sydney Darling Harbour and Sofitel Bali Nusa Dua Beach Resort. Sofitel is part of AccorHotels, a world-leading travel and lifestyle group which invites travelers to feel welcome at more than 4,300 hotels, resorts and residences, along with some 10,000 of the finest private homes around the globe.